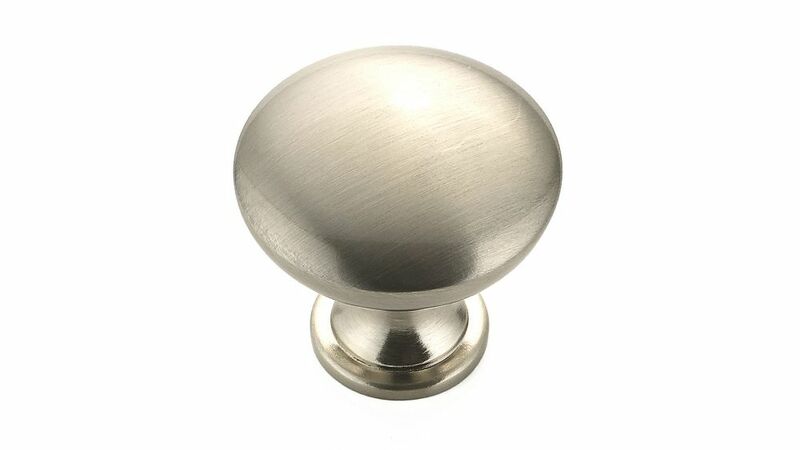 This contemporary 30 mm round knob by Richelieu comes in a beautiful brushed nickel finish. This product works well with contemporary kitchen and bathroom decor. Hardware included. The elegant head of this contemporary knob flares out from a stemmed base to a smooth convex surface. A refined way to enhance drawer fronts and cabinetry. The concentric rings on this mushroom shaped knob create wide grooves and add a rich texture to contemporary furniture. The mounting hardware is included for an easy installation. Contemporary mushroom-shaped knob by Richelieu. Its simple discreet shape and smooth surface will enhance your furniture and dicor. The mounting hardware is included for an easy installation. Pack-10 Contemporary Metal Knobs 1 3/16 in (30 mm) Dia - Brushed Nickel - Copperfield Collection This contemporary 30 mm round knob by Richelieu comes in a beautiful brushed nickel finish. This product works well with contemporary kitchen and bathroom decor. Hardware included. Pack-10 Contemporary Metal Knobs 1 3/16 in (30 mm) Dia - Brushed Nickel - Copperfield Collection is rated 4.7 out of 5 by 9. Rated 5 out of 5 by Annette from Quality of the pulls and knobs was very nice, size... Quality of the pulls and knobs was very nice, size ordered fit exactly. Very happy with purchase. Rated 4 out of 5 by CJ from I was pleased with this product, size was perfect. Screws... I was pleased with this product, size was perfect. Screws included were a little short so I used my existing ones but the look is good. Rated 5 out of 5 by JChap from GREAT look for the budget. Clean and easy!! GREAT look for the budget. Clean and easy!! Rated 5 out of 5 by Nic53 from Good product! I bought these to replace the knobs in our kitchen, and they look great and were easy to install. Good quality for the price!